For the rest of the club it was a stellar day, with our boys taking home Seven wins. 2nd Grade survived a 26 run last wicket stand to take out their match by 4 runs. Rahul Thakur and Nathan Robins each took 3 wickets, and stand in skipper Grant Hines had two run outs that would prove to be the deciding factor. 3rd and 4th Grade had comfortable victories after setting huge totals last week against Wallsend. In 3rds, Liam Wilson (4/37) and Simon Massey (4/83) were crucial to get the job done. In 4ths, Steve Christie was damaging once again with 3/18. In the one day comps, 5th Grade had their closest game to date, restricting Merewether to 9/108 and chasing it down with 4 wickets in hand. Tom Newman (3/19), Sam Guy (2/18) and Sam Carless (2/19) were the pick of the bowlers, and Rory Guy (38*) was the key to the run chase. C5’s also continued their undefeated streak, making it 4 WMDCC teams on top of the ladder after 5 games. 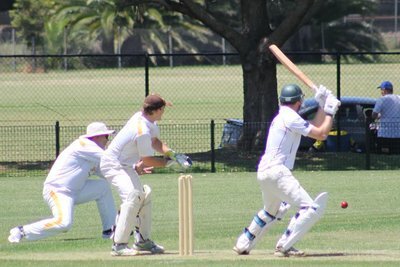 In a close one, they managed to restrict Hamilton Station to 151 off their 35 overs after being bowled out for 154 earlier in the day. D1s had two of the best individual performances of the day. Skipper Matthew Quinn took 4/39 including a hat-trick as they bowled Teralba out for 171. Troy McGrath (103*) then put together an unbeaten century as they got home comfortably with 8 wickets in hand. D2s had their best game this year, chasing down Hamilton Station’s 182. Roger Laffrey (95*) was the star in the run chase, and Matthew Campbell was great with both bat and ball putting together 40* after taking 2/19 earlier in the day. The pair had an unbeaten partnership of 112 to get the boys home after being 6/73. Well done guys, let’s go one better next round and get that keg!